Reduced power consumption has become of key importance in memory system design—from mobile to enterprise-class applications. In addition to clocking power and DRAM core access power, IO signaling power must be addressed in order to reduce the total power consumption of the memory system. Near ground signaling is a single-ended, ground-terminated technology theat enables high data rates at greatly reduced IO signaling power while reducing design complexity by supporting significantly reduced signal swings of 500 millivolts (mV) and below. What is Near Ground Signaling Technology? Near Ground Signaling (NGS) is a single-ended, ground-terminated signaling technology that enables high data rates at significantly reduced Input Output (IO) signaling power and design complexity, while maintaining excellent signal integrity. 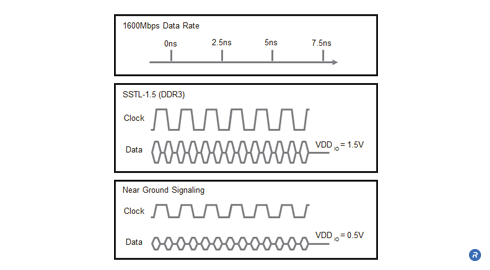 With a VDDIO of 0.5V, Near Ground Signaling has a reduced signal swing compared to traditional Stub Series Terminated Logic (SSTL) signaling and lowers IO power on both the DRAM and controller. This lower IO voltage is better matched to the operating voltage of advanced CPU’s and GPU’s and reduces the cost and complexity of integrating the memory controller on the processor chip. Memory designers benefit from the reduced design complexity, lowering their integrated memory controller implementation costs. They are also able to achieve increased data rates at significantly reduces IO signaling power.